Belly the pig gave birth to eight little piggies! There was great excitement today on Landmeterskop Farm when the widow Potts, Belly the pig, gave birth to eight little piggies! One died and is now with his late father, Mr Potts, somewhere over the rainbow bridge in piggy heaven. Two are a bit weak and are being hand-fed, but the rest are all doing fine. They are cuteness personified! 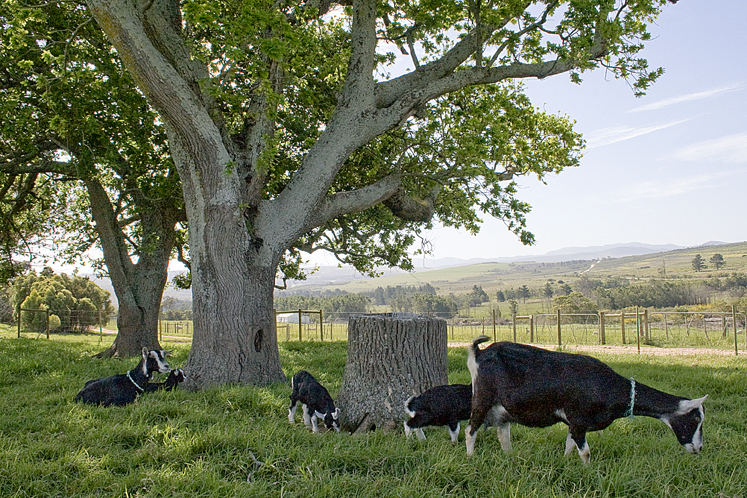 Daisy, the one resting in the shade of the tree, is raising twins – Rosy and Annie. Milking time… what a relief! Valerie is thinking of learning to make cheese… that would be quite neat, I think. 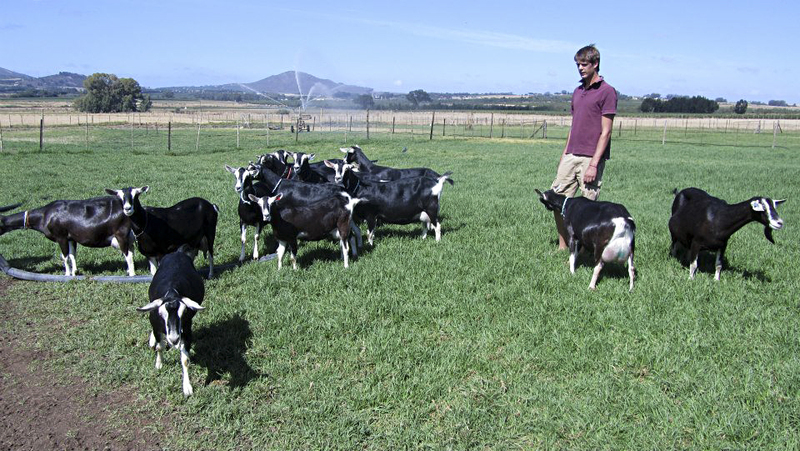 We are British Alpine goats and were bought from Walter Curlewis (0847758172) of Paarl who has been breeding goats for ten years now – he started when he was only fifteen. Before joining his father in the family-business, he worked at Fairview Farm. 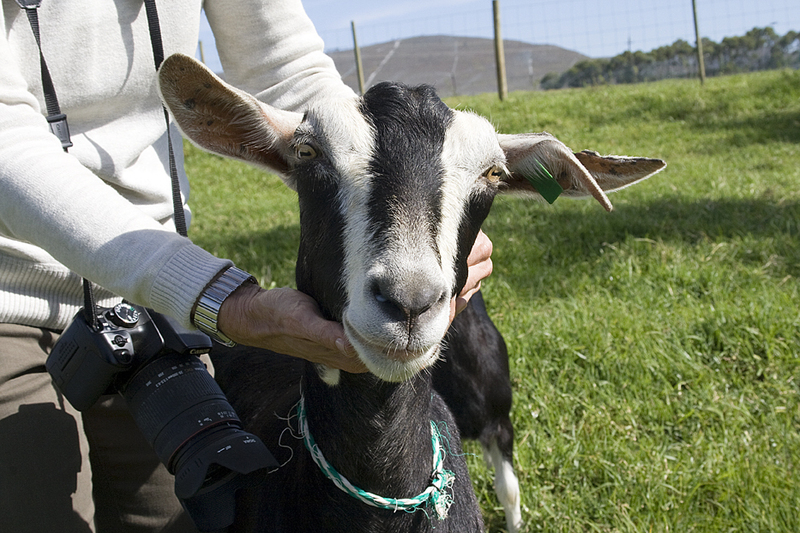 The British Alpine goat was developed in the early 1900s and is used for milking, showing, breeding or just for keeping as pets. 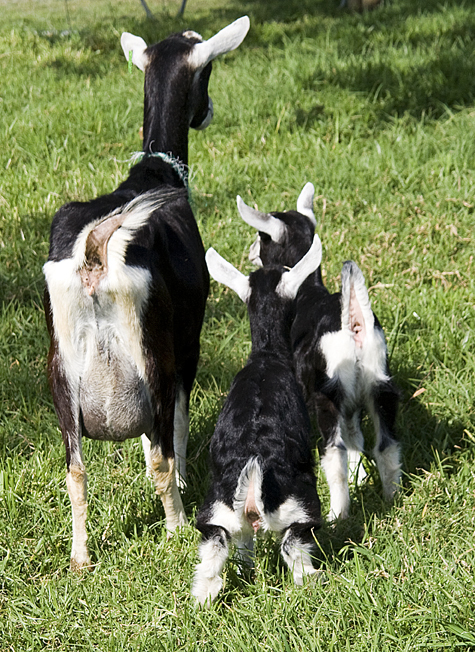 We are black all over with white ‘Swiss’ markings – white facial stripes stretch from above the eyes to the muzzle, while the edges and tips of ears, legs from the hocks and knees downwards, and both sides of our tails are also white. Quite handsome, don’t you agree? Important: Please check with the owners or manager for a suitable time to interact with our kids!